For some sites, drawing attention to the author or authors on your site may be a key piece of your overall strategy. Perhaps you’re trying to establish a more personal tone. Perhaps you’re trying to build a reputation. Perhaps you’re trying to attract quality contributors. These are but a few potential reasons why you might want to make sure your readers connect the content with the person writing it. But do your current author boxes do the job as well as they could? If not, and you’re looking to liven up them up, then one of the plugins below may just do the trick. While not packed with options, it is very attractive out of the box. It also has a tab to show the author’s latest posts (pictured above). It lets you show the box above, below, both above and below Posts, or not at all. It gives you the same option for Pages. In addition, it lets you determine how many posts to show in the Latest Posts tab. It then gives you options to control the colors of the box. Here’s a look at some settings. Loaded with tons of options, the WP Biographia plugin aims to give you control over nearly every aspect of your author boxes. In addition to integrating Google+ authorship and social icons, it lets you use shortcodes to display only the social icons, adjust the size of your images, choose the location of your author, let you change the styling of the author box through CSS and HTML boxes, and more. Here’s a look at the in-depth styling options for those who like to get their hands dirty. The Custom About Author plugin lets you choose which types of posts you’d like to place your author bios on (home, single post, single page, archive page). In addition to the normal icons for social media sites, this plugin gives you the ability to add icons for your own customized links (through the Profile page). The Author Box with Different Description plugin’s primary appeal is that it lets authors put in a different bio for different posts. This is especially helpful if you have guest bloggers with more than one post. As a general rule, guest bloggers blog to promote themselves and for SEO purposes. If they have to use the same bio on each post, it limits the number of things they can promote. This plugin could help with that issue. Here’s a look at the bio box. You get a different description on a post by using the custom fields metabox at the bottom of the post. Add author_desc and then your customized author bio. It comes with the ability to add text or icons for different social media site. Here’s a look at its settings page. The WP About Author plugin is a relatively simple solution that will let you change the color of your author box, choose where to show the box (top or bottom of post), and also on which types of pages to show the box (front page, archives, search results, single post pages, in RSS feeds). Here’s a look at its settings page. The Author Box After Posts plugin is about as simple as it gets. There is no settings page. Just upload it and activate it. Here’s the look you’ll get. The DT Author Box is a simple plugin without a lot of bells and whistles. It adds a bio box to the end of your single posts. It does not automatically use your gravatar image. You will need to upload an image for it to use via your profile page. One thing it has going for it is a nice boarder it puts around the author image. Note: This plugin includes a link back to the developer, but you can turn it off in the settings section (again, on your profile page). 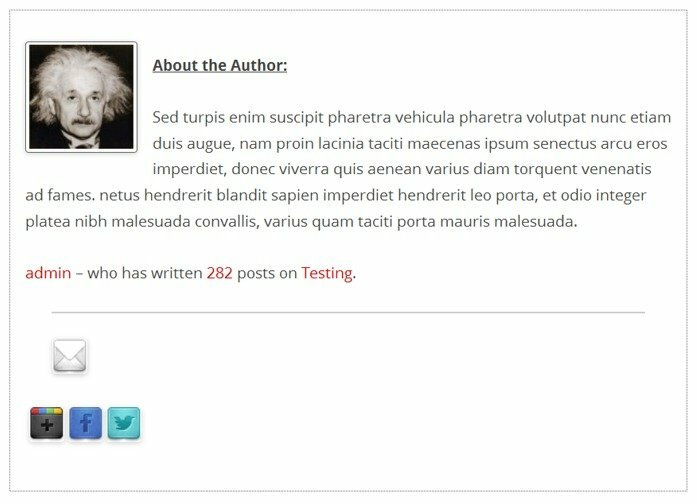 The Better Author Bio plugin lets you control the position of the author box, whether to show a gravatar or not, the number of post the author has written, and some general text that goes in the box. Here’s a look at the settings page. Many themes already include an author box, and if this is your case, then you will probably find that the plugins above add a second author box to your pages. Of course you don’t want that, and so in order to remove the original author box, you will need to dig into your code a little. As always, if you’re making changes to your theme, it’s better to use a child theme. In order to remove the default author box for your theme, you will need to find out where the code is located. Most often author boxes will show up on your single post pages, and so you will want to check your single.php file and search around for the code that pulls in your author box. In many themes, however, the single.php pulls in other files, and the code you need will be in one of those other files. For example, in the default Twenty Twelve theme I used for testing, I didn’t find information about my author box, but I found that the single.php file pulls in a file called “content,” which looked like what I wanted. I then went to the content.php file and tracked down the code that was displaying my author box. In some themes, this may be just a little bit of code. In this case, it was quite a bit of code. Here’s the code I would want to delete in the Twenty Twelve theme. Instead of deleting the code, another way you could do it is to simply comment out that portion of the code. You can do that in the following way. And that’s it. If you’d like to spice up your author profiles, one of the above plugins should work out for you – making your bio stand out a little more and hooking up to your social profiles at the same time.